The Cubs’ brain trust, seen here during the 2015 NLCS, is but one of the MLB front offices deeply influenced by sabermetrics in recent years. It’s getting more and more crowded on baseball’s bleeding edge. 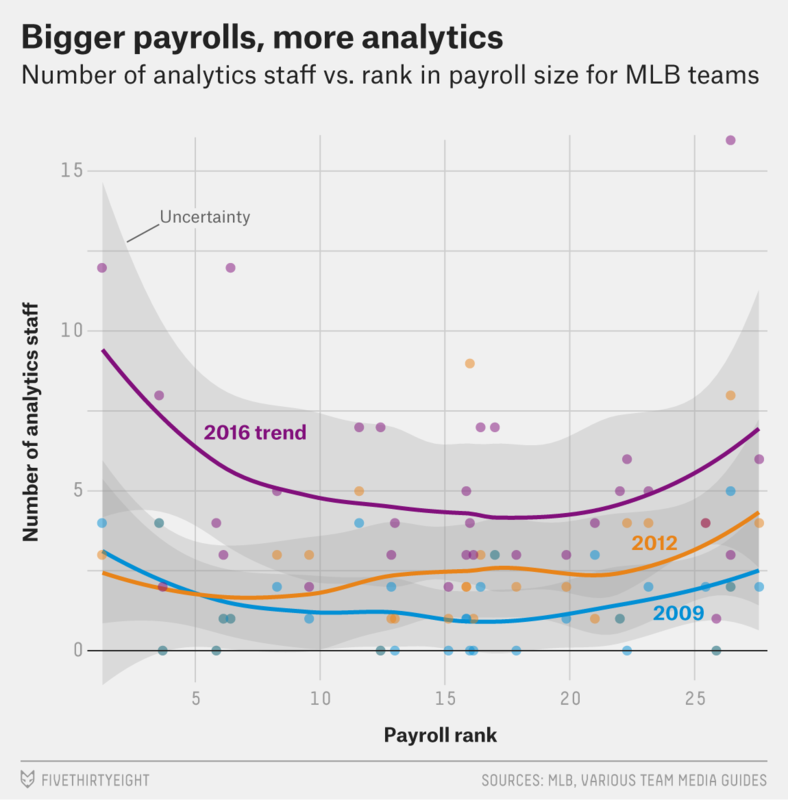 As sabermetrics has expanded to swallow new disciplines and data sets,1 the number of quantitative analysts in MLB front offices has multiplied to keep up, producing an army of number crunchers, modelers and decision scientists who would have seemed out of place at the ballpark even a decade ago. Because we, too, are statheads at heart, we’ve mined the data and charted the proliferation of these numbers-savvy front-office staffers over time. Yes, there are more of them now than ever, and yes, they’ve had a demonstrable effect on their teams’ fortunes. But contrary to the “Moneyball”-era hand-wringing about battles between scouts and statheads, their rise hasn’t come at the expense of old-school analysis. Rather, the two main points of contention are how much the “Moneyball” mindset has spread from the game’s most frugal teams to the richest ones; and why the front-office hiring boom hasn’t helped its gender diversity. To track the expansion of baseball’s R&D departments, we took three snapshots of MLB staffs by studying cached online directories and team media guides from 2016, 2012 and 2009 — the first year for which media guides are widely available from MLBpressbox.com — and consulting with current and former front-office employees. We limited our sample to full-time employees (sorry, interns and consultants),2 and tried to maintain a consistent, fairly strict definition of what constitutes a quant: a “baseball operations” employee who spends a majority of his or her work hours either directing a quantitative department or doing statistical research, data processing or programming to support the team’s analytical efforts. Naturally, our task occasionally required some informed speculation. “Analytics” and “analyst” are slippery terms, particularly because most front-office employees are multitaskers who contribute to more than one department. Many teams are also guarded in how they describe (or don’t describe) their employees’ roles and responsibilities. But even with all those caveats, we’re confident that we’ve arrived at a roughly accurate accounting of MLB’s quant army. Nor is there any indication that we’re approaching a plateau. A number of teams told us they expected to add more analysts soon; we’re aware of at least 12 open positions across MLB. And because the litany of prerequisite degrees and programming languages seems to grow with each listing, it seems certain that the average analyst also has a more impressive résumé today than in the past. The biggest benefits of buying into objective analysis were probably reaped around the time “Moneyball” was published, when a lot of the low-hanging fruit was still attached to baseball’s most rigid branches. Simple lessons such as “on-base percentage matters more than batting average” still eluded many front offices, and numerous talented analysts whose work would later be exclusive to one team were still posting their insights publicly on message boards or sites such as Baseball Prospectus. Even though some of the initial rewards had already been realized by 2009, there were still significant gains to be made by semi-early adopters. To measure them, we built a model estimating how good a team was before its front-office hires, using the following factors for each team: its winning percentages over the previous three seasons, its payroll and market size and its Baseball America farm-system ranking. Using these variables, we generated an expected winning percentage for each team over the following three seasons, beginning with the two historical years for which we had analyst counts (2009 and 2012). The takeaway: It paid to invest in analytics early. Teams with at least one analyst in 2009 outperformed their expected winning percentage4 by 44 percentage points over the 2012-14 period, relative to teams who didn’t — an enormous effect, equivalent to more than seven extra wins per season. That might be overstating things a bit — the precise advantage varies depending on how the analysis is structured — but over most permutations of the model we tried,5 the effect was consistently stronger than two wins per season, particularly for the earliest-adopting teams, which got a head start by implementing analytics before 2009. Perhaps we shouldn’t be surprised that sabermetrics conferred such a first-mover advantage. 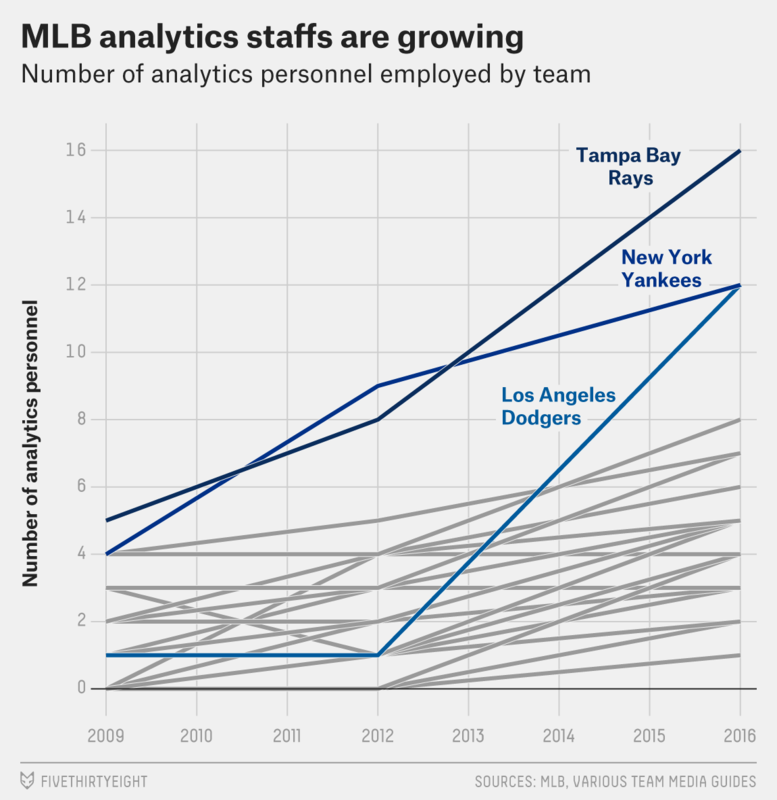 As a thought experiment, let’s assume the typical modern analytics department contains five people (156 staffers leaguewide, divided by 30 teams). If the two most senior members of the department earn $100,000 a year and the remaining members make half that, the yearly price would come to $350,000. Putting aside overhead costs,6 that outlay still lags behind the MLB’s minimum salary for a single player — chump change in a sport where the average franchise is valued at 10 figures. For such a relatively small expenditure on analysts, even the minimum estimate of two extra wins per year would represent a return roughly 30 times as efficient as spending the same amount on the free-agent market. (It would be like the Chicago Cubs signing outfielder Dexter Fowler not for the $13 million he’s actually making but for what it would take to pay a player who just made his big-league debut.) At that rate, there’s plenty of room for front-office inflation to continue before teams run into diminishing returns. Although the big-budget Boston Red Sox were also one of the first teams to demonstrate that an analytics department could help win a World Series,7 a number of low-payroll, small-market teams — including not only the Moneyball A’s, but also the Rays, Indians, Padres and Pirates — were among the first to form quantitative departments and develop systems to house and display statistical data. It made sense: The more pressing a team’s financial imperative to stretch every dollar and wring out every win, the more likely it was to try a new approach. But that’s no longer true. Although the Rays, who rank 29th in payroll this season, continue to occupy the R&D pole position with a still expanding department of almost 20 statheads — fortunately, Tropicana Field has plenty of quiet, climate-controlled workspace to spare — baseball’s “haves” are no longer have-nots when it comes to statistical expertise. In both 2009 and 2012, teams with low-ranking payrolls tended to employ more analysts. But in 2016, the balance of analytical buy-in shifts toward big spenders, which might explain why the Rays are having a harder time separating their on-field performance from the pack. Not only are wealthy teams capable of outspending competitors for free-agent players, but they’ve also become more willing to outbid them for brains. The sport’s two heaviest hitters by payroll, the Yankees and Dodgers, are also the only teams aside from the Rays whose R&D departments have double-digit head counts. In addition to hiring a large crew of new number crunchers and programmers, the Dodgers have plundered talent from other franchises’ front offices, absorbing not only the former general managers of the Rays (Andrew Friedman), Padres (Josh Byrnes) and Blue Jays (Alex Anthopoulos), but also a former A’s assistant GM, Farhan Zaidi, who joined Oakland as an analyst because “Moneyball” made him want to work in baseball. In particular, LA’s brain trust has devoted its efforts to preserving player health, which Billy Beane has publicly labeled the sport’s most glaring inefficiency. In their quest to curtail injuries, the Dodgers have invested in both computerized systems and human know-how, as well as seeding a sports-oriented startup incubation program. Lewis’s postscript looks ironic in retrospect, for multiple reasons. The deputy he describes as “someone comfortable with statistical analysis” was Keith Law, who has since become ESPN’s lead prospect analyst and spends much of his time scouting players. Moreover, Ricciardi himself was fired in 2009 and replaced by Anthopoulos, who almost immediately embarked on a scout-hiring spree — and shepherded Toronto to more success than it had ever enjoyed under his predecessor.8 Even Beane’s stat-inclined sidekick, Paul DePodesta, later became vice president of player development and scouting for the Mets before switching sports earlier this year. In fact, the recent expansion of analytics staffing doesn’t seem to have squeezed out other kinds of employees. By our count, big-league teams employed 1,246 full-time scouts in the first year of our sample,9 across all levels and specialties — pro, amateur, advance and international. This year’s media guides list 1,539 scouts — an average increase of almost 10 per team. Only five teams employ fewer scouts than they did in 2009, and of those, four were previously among the top five scout employers. No team has downsized by more than six total scouts or 12 percent of its previous force. Although the increased ability to access information remotely may have made some advance and pro scouts redundant — or transferred their responsibilities to new, stay-at-home scouts who prep for opponents using a combination of stats and video — any modest downsizing in those areas has been more than offset by increased amateur and international coverage. For instance, the Rays — who also devote a massive head count to scouting, trailing only the Yankees and Red Sox — assign dedicated scouts to 12 countries outside the U.S., some of which haven’t historically been baseball hotbeds.10 No scouting position is permanent, but our survey uncovered scant evidence to back up claims that teams are treating scouts as obsolete relics. If anything, smart teams have learned to treat scouting grades as statistical data that can improve upon purely numbers-based evaluations, making the two perspectives even more tightly intertwined. Given baseball’s burgeoning economy, it’s only logical that additional jobs for statheads haven’t come at scouts’ expense. Ever-rising broadcast rights and franchise valuations have caused revenue to skyrocket, and the profit has to go somewhere besides under owners’ mattresses. As revenue sharing, luxury taxes, and limits on amateur and international spending lower the ceiling on some forms of spending and shrink the payroll gaps between teams, the best option for a cash-flush club is to direct dollars away from the field. Beefing up front-office infrastructure makes acquiring, storing and applying information easier, and it allows teams to get more bang for the bucks they’re allowed to spend. The data generated by a single game has gone from mega- to gigabytes, with terabytes sure to follow before long. Disclosure: One of this article’s authors, Rob Arthur, works as a statistical consultant for the Toronto Blue Jays. Only one of those departments — perhaps predictably, the tightfisted Miami Marlins — is still a solo act. As predicted by the model. Including using different thresholds (by number of analysts) to determine a team’s analytical buy-in, and different periods of time upon which to judge a team’s on-field output. Which, admittedly, can be quite large (i.e., in the millions) for some front offices. But even with multi-million dollar overhead costs, the total price of an analytics department wouldn’t approach most free-agent player contracts of similar value. Boston may have even been the first to win with a dedicated analytics staff, though it’s also worth noting that the Oakland A’s won in 1989 with early sabermetric consulting from Eric Walker. Anthopoulos left the Blue Jays for the Dodgers after the 2015 season. Which in most cases dates back to 2009, except for the few teams whose 2009 media guides don’t have accessible scouting sections. In those cases, we used 2010 data. Including Curacao, Germany, the Czech Republic and Brazil, where they’re trying to build an academy.